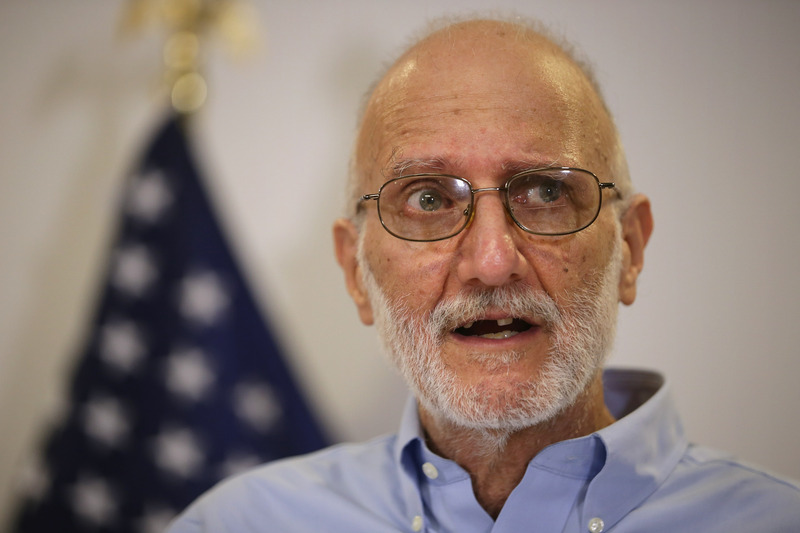 Wednesday was a huge day for U.S. relations with Cuba, as you might just have heard: President Obama announced his desire to end the States' 55-year embargo with Cuba, alongside the major announcement that American aid worker Alan Gross was coming home. Gross, 65, has spent the last five years jailed in Cuba for bringing unauthorized communications equipment into the country — satellite phones in particular — but now, he's finally returned to American shores. Wednesday afternoon, Alan Gross gave a relieved press conference to the country, thanking President Obama and explaining what kept him going throughout his harrowing detention. Speaking to the press, and effectively to the entire nation, Gross began with a nod to his Jewish heritage, citing the beginning of Hannukah — "the best Hannukah that I'll be celebrating in a long time" — before remarking on how blessed he felt to be an American citizen, and thanking President Obama for all that he'd done "today, and leading up to today." As Obama himself revealed in remarks Wednesday morning, the release of Gross and his attempt to thaw U.S./Cuban relations has been in the works for a while now, in negotiations partially aided and brokered by Pope Francis and the Vatican. I want to acknowledge the extraordinary, determined efforts of my wife Judy, 44 and a half years we've been married ... and my lawyer and personal Moses, Scott Gilbert, and their efforts to restore my freedom. They have my endless gratitude, love and respect. ... Senator Patrick Leahy of Vermont has been instrumental in shepherding this day, and I want to thank all the members of Congress, from all sides of the aisle, such as Senator Flake, Representatives Chris Van Hollen and Barbara Lee and numerous others, who spoke up for, visited me, subjected themselves to my ranting, and helped me regains some of my weight. Even in Cuba, M&Ms melt in your mouth, not in your hand. Gross' weight, or lack thereof, was one reason U.S. officials feared so much for his health. He embarked on hunger strikes while protesting for his release earlier this year, once going as long as nine days without eating, a debilitating enough feat even when taken by a far younger person. These concerns were somewhat accentuated by his appearance at the press conference — Gross appeared thin, gaunt, and visibly missing several teeth, which he also announced he plans to get replaced soon. On the matter of the news that came wrapped up with his release, President Obama's desire to normalize U.S. relations with Cuba, Gross was highly supportive. To me, Cubanos (or at least most Cubanos) are incredibly kind, generous, and talented; it pains me to see them treated so unjustly as one consequence of two governments’ mutually belligerent policies. Five and a half decades of history show us that such belligerence inhibits better judgment; two wrongs never made a right. I truly hope that we can now get beyond those mutually belligerent policies. I was very happy to hear what the President had to say today – it was particularly cool to be sitting next to the Secretary of State as he was hearing about his job description for the next couple of months. In all seriousness, this is a game changer which I support. Gross concluded his remarks with a simple enough message — enjoy the holidays! And there can be little doubt he'll be practicing what he preaches, as at long last, he gets to spend them with his family again. ... I will close with a quote from a Nelson DeMille character, “it’s good to be home”. Thank you. I wish all of you a happy holiday season.